Complete photo adjustment: Quickly enhance photos with a wide variety of adjustment tools, including Crop, Straighten, Highlight Recovery, Noise Removal, Color, Temperature, Exposure, Highlights, Fill Light and more. Support for hundreds of RAW profiles: With more than 250 RAW camera profiles (and counting! ), AfterShot 2 supports RAW files from all major camera manufacturers. Powerful & customizable photo management: Quickly organize your photos, and easily add new ones at any time. Powerful search tools, including ratings and keywords, let you find the right photos when you need them. Access photos from existing folders, on a network or on a memory card. Catalogs can help you organize and manage your collection as it grows. Batch processing: Process single batches of images quickly using presets or custom settings. Quick review: Trouble deciding between similar shots? Easily compare two images side-by-side in AfterShot 2. Multi-version editing: Easily make adjustments to multiple versions of your master photo while ensuring the original is always protected. Precision editing: Apply adjustments exactly where you want them with Selective Editing. Use Layers and Regions to isolate precise areas of your image for adjustment. Red eye removal: Get precise control when cleaning up red eye in your photos. Accurate color correction: Enjoy extensive control over the color in your entire image or any single color with several adjustment tools. Lens correction: Fix lens distortion and restore the detail and accuracy of your images with advanced lens correction processes including Geometric, Vignette and Chromatic Aberration. Quick web galleries: Create a web gallery to share your images online. Choose from various gallery styles to control how your photos are displayed. Easy back up: Use batches to easily back up and archive your images. Multi-platform support: Corel AfterShot Pro 2 is available for Windows, Mac and Linux. Multi-seat licensing: Install on up to three PCs for non-concurrent use—no subscription required. Complete High Dynamic Range (HDR) tools: Available now for Windows and coming soon to Mac and Linux. Dramatic speed improvements: Thanks to full multi-threading and OpenCL support, take advantage of exceptionally fast RAW conversion and batch processing that’s up to 4x faster than the competition. More pro-level adjustment tools: Take advantage of Local Contrast and additional color correction options. Catalogs: AfterShot Pro 2 supports up to 20 open catalogs. AfterShot 2 retails for $39.99, while AfterShot Pro 2 retails for $79.99 (although it can be found for less at the time of this post). 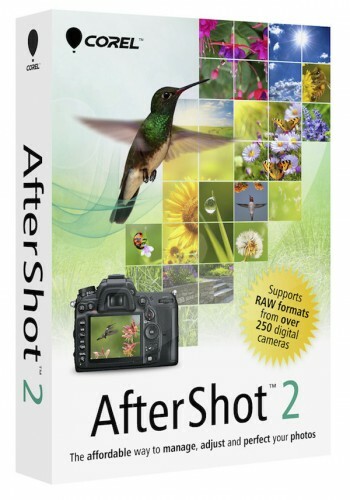 You can buy AfterShot 2 here on Corel’s website.